All-in-One download manager is fastest download manager available on the market with simple and easy to use interface. This is most advanced download manager for downloading music, videos, movies, games and torrents. This app also supports torrents download. Download service usages advanced algorithms to save battery and usages less CPU resources. Are you bored with traditional slow speed downloads? Do you want to download music, videos, games and torrents with lightning fast speed? If yes, then this download manager is best suited for you. This app also supports pause and resume features. This app also handles errors very smartly. All downloads with errors can be resumed and if download resume is successful then previously download file parts are used. This results fast speed download and less data usages. To reduce data usages download only wifi option is also given. Foreach download multiple threads are used which helps to fetch files faster. In order to reduce resource usages All threads shares same network connection. Smart power management algorithms are used to reduce battery usages. User can set download only while charging or select custom battery percentage to stop download when battery is low. To further reduce power usages automatically download on device reboot and keep CPU awake functions can be turned off. Download links are automatically grabbed from device browser and clipboard. Torrent downloads are also automatically fetched and download can be started. Torrent files and torrent magnet links can be opened directly with download manager. All Downloads are shown in simple and clean interface. Downloads are categorized into various categories according to file download state i.e. (Stopped, Pending, Connected, Running ,Completed and Failed). All file downloads can be started or stopped at ones. While downloading download settings can be changed and these settings are applied on the fly. Download manager automatically fetched file name and file size, but still user has option to change file name. For Duplicate download links numbered filenames are used. Files are automatically arranged in separate folders according to file type. Custom default download location is also supported and can be changed by settings. User can also change useragent for various downloads. Downloads can be started with servers which requires username and password. If there is no free space on device then don't worry, you can also download directly to SD card. Torrent downloading can be highly customized. All torrent types can be turned on or off. custom torrent connection limit and custom download speed setting is also possible. NOTICE: Please Note download videos from youtube is not supported, according to youtube and playstore content policy. If user tried to download from youtube then that download will be blocked. Disclaimer: Downloading and viewing files protected by copyright is prohibited and not recommended. File user downloads should be illegal to download in respected country. We assume no responsibility for misuse of our app. ❋ Super Fast video download engine added to private browser. ❋ Now Capture video and music from browsers. ❋ Advanced torrent download feature added . 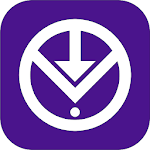 ❋ Download speed visible for each task and notification. ❋ Advanced error handling algorithm added. 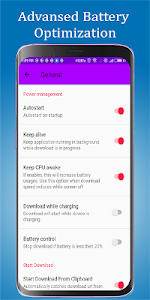 ❋ Battery optimization in background service. Similar to "AIO Download Manager: Download Video Music Torrent"